Author pens fantasy fiction book about mother’s search of her lost daughter. 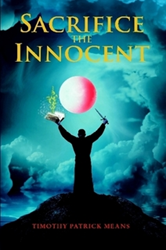 Fantasy fiction novel Sacrifice the Innocent (published by Lulu) by Timothy Patrick Means is a story of good over evil, focusing on a mother’s unrelenting desire to save her daughter. What she does not know is that it was already predestined that her daughter must die, because of a selfish greed for gold from a family ancestor that resulted in the curse that haunts her family today. “A mother’s love is never fading no matter what time we live. A mother will always love their child, they are a part of them, no matter what,” the author says. The story follows Barbara and Mark Harding, whose daughter, Melissa, was taken for the sole purpose of sacrifice. Sterling, the psychic detective, gives Barbara the Mother’s Regret crystal to help fight an evil named Tobias, the sorcerer who wants to come back to life after making another sacrifice of an innocent girl 500 years ago. Stanis, a powerful modern day wizard, helps defend against the hidden evil monsters lurking in the book of magic. Joining the main characters is Shakira, a Jamaican spell binder who joins the final battle to save Melissa. Standing there alone, staring at the object in her hand, she wondered where the power arrived from that clearly had some authority over this evil. As she stared at it, its light diminished until it remained a soft, almost nonexistent, shining orb. She decided that perhaps it should sit on Melissa’s dresser for the time being, in case that creature decided to come back for a visit. She walked over to the dresser and placed the crystal near a photo of the family together at a much happier time in everyone’s life when everyone wore a smile. “Love your mother, because the bond between you both cannot be broken, unless you allow it,” Means adds. Timothy Patrick Means grew up close to Newport Beach. Going to school made it rough because he suffered from lack of sleep most of the time, as he was working every night. He lost his father at the age of 19; he cannot say that he will ever get over that horrible time in his life. The anguish he felt has caused him to search out a release for his pain- through writing.